A lot of people think that eating healthy equates to eating bland food, but they’re gravely mistaken. You can still enjoy tasty meals without giving up on your health status. Now, how is that even possible, you ask? Put the salt shaker away. Adding salt is not the only way to enhance the flavor of your food, you know. Rather than sprinkling more sodium on your meals, replace it with herbs and spices, such as onion and garlic powder, black pepper, cumin, oregano, paprika, cayenne, etc. These flavorful additions will pack the punch you’re looking for in every meal. Several herbs and spices come in small packets, so you don’t have to invest a fortune to try them out. Aren’t you tired of eating the same thing over and over again? How about trying out a new recipe? If you can, go for a full course meal. Add soups, appetizers, and sidings! This trick can help you take in more vitamins and minerals. At the same time, it might even lead you to lose a couple of inches off of your waist! Having the right meal portions are important in achieving a well-balanced diet. It will help you lose weight and feel more satisfied with the food you eat. For every meal, you should fill half of your plate with sources of fiber (like fruits and vegetables). Next, a quarter of it should be for protein while the other quarter should be for carbohydrates. Lastly, you can include a small cup of dairy for dessert. Find ways to add in more fiber. The more fiber you have in your diet the more benefits you reap. Fiber helps with digestion and weight loss. It prevents you from suffering from constipation too! Fiber can be found in an assortment of food items. Aside from fruits and vegetables, fiber is also available in whole grains, brown rice, beans, nuts, berries, etc. You surely won’t have a hard time including it in your diet! Every once in a while, we all have those cravings. It can’t be helped. Some days it’s just nice to eat something sweet or fried, don’t you agree? Don’t worry, even if you give in to your cravings, you can still live healthily. Just make sure you control your portion sizes, or cook the food yourself and swap out the other ingredients with healthier options. That way, you can give in to your cravings guilt-free! While cooking is fun, it can also be tiring. This is where having a carer from Abundant Life Assisted Services comes in handy. 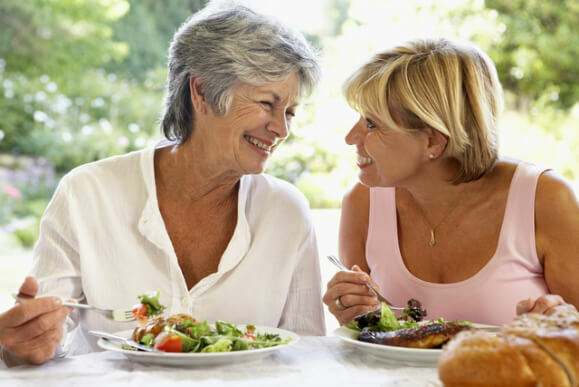 We will help you cook the meals you love and provide you with excellent senior care services too! Get in home elderly care services in Georgia you can trust with Abundant Life Assisted Services. This entry was posted in Senior Care Services and tagged Eat Healthier, Health, health tips. Bookmark the permalink.